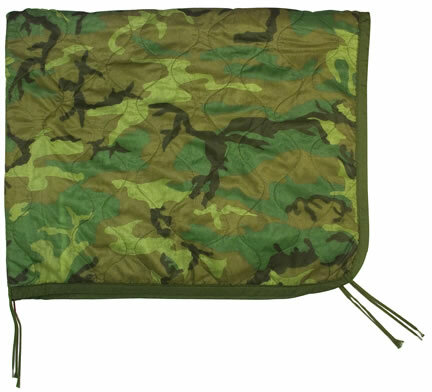 The poncho liner has always been a favorite for military personnel. Soft, comfortable and keeps you warm in moderate temperatures, the "woobie" as it's sometimes called, always has a spot in your outdoor gear. This also fits and attaches inside your poncho to keep you warmer when it's cold and raining. During summer months, this is all I'll take with me for sleeping. I can crawl into my hammock and stay warm even on cool nights. Very lightweight so it's like you're not even carrying anything. I went on. a semi-survival trip to the desert remote corral ring of Clipperton in Dec 2011/Jan 2012. Because of the weather, I had to swim in rough heavy surf pushing a couple of dry bags. "Heavy" equipment stayed behind and the liner was my sleeping bag. small, light and warm enough combined with a travel hammock and tube tent to keep my body heat. Adaptability is key in such trips. Plan A, B and C are required. That was plan B. No tent nor sleeping bag. You don't want to know my plan C!.